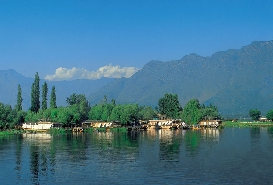 Dal Lake Located in Srinagar city, which is 6.4 km long and 4km wide, and within its periphery, four enormous expanses of water - Lokut Dal, Bod Dal, Gagribal and Nagin. Hence, Dal Lake is not a flat, continuous mass of water, but an intricate maze of waterways, making for a spectacular sight and an even more enchanting locale to explore.To the delight of the visitors they can enjoy fascinating rides on traditional Kashmiri Houseboats and Shikaras. 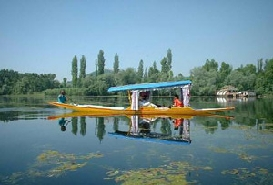 The Shikara ride can be an hour-long sightseeing session of the Dal a shopping-by-shikara expedition to handicraft shops within the lake area; or a whole-day trip featuring visits to major landmarks in Srinagar. 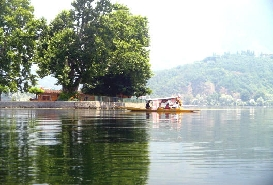 This beautiful lake of Kashmir valley is revered not only for its spectacular beauty, but also for its vibrancy, because within its periphery, the lake sustains a unique life, unmatched elsewhere. The Houseboat and 'Shikhara' communities have lived for ages on the Dal, and have created such a complete infrastructure that they do not need to step on land for their day-to-day sustenance.